Apple’s new iPhone 6S and 6S Plus came with stand-out new features called Live Photos. Live Photos is a new feature which can automatically captures a full resolution photo as well as a few seconds of video before and after each photo, and will resulting in a GIF like animation. You can watch back and interact with using 3D Touch which means it doesn’t same like conventional GIF file. It needs to click to play and hold on it. However, it not actually animated GIFs, but is just Apple’s own proprietary file format which not able share to social media or on-Apple user. Once you captured the memorable moment and want to share across social network or to a friend which is non-Apple user. Things tend to be more complicated. The most fastest and easier way is to import your video to your computer and manually create an animated GIF file, which is time-consuming. Good news! 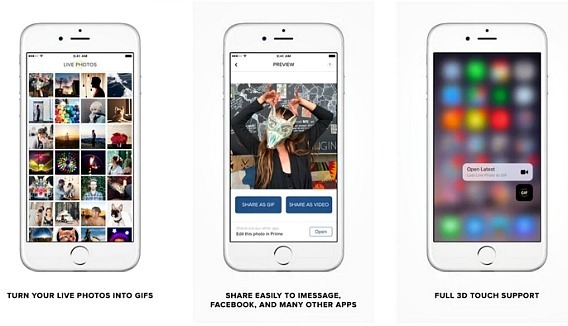 A new app was launched called Live GIF which can help you convert your Live Photos into GIFs which is shareable and viewable with anyone by MMS, email or shared directly on social media. The best part is, when you launch the app, it will automatically detects any Live Photos on your phone and doesn’t need much setting. Displays your Live Photos in grid view and pick one of them, choose whether you want to convert it as a GIF file or normal video file format and share. That’s it! You can now save and share to your friend through any social network. Live GIF is available on App Store and cost it $ 1.99 only. It is compatible with any device running iOS 9.0. Grab it and share the moment with your friends and family.